NOTE: The news accounts below were originally linked to the original sources. However, as many of them are now disappearing from the internet, I have quoted them here so that they will remain available to those who wish to know what happened to Ciaran. I have not made any changes in their original content. A 19-year-old Catholic man was shot dead today in Northern Ireland in a killing that police have described as "professional and well organised". Fear and hostility were palpable on Antrim's Greystone Estate Thursday afternoon as shoppers hurried home, keen to avoid eye contact with neighbours and strangers. Nationalists have been warned to be vigilant following the killing of a Catholic man in Antrim. Sinn Féin and the SDLP have said the murder was sectarian. There was growing concern last night of further attacks as tension mounts in advance of Sunday when loyalists will gather at Drumcree after the Orange Order was banned from marching down the Garvaghy Road. Ciaran Cummings, the Catholic teenager shot dead in Antrim on 4 July, had been threatened by loyalists, says Sinn Féin councillor Martin McManus, who blames the Loyalist Volunteer Force (LVF) for the killing. Ulster Unionist leader Mr David Trimble today said there was "good reason" to suspect the 19-year-old Catholic man killed in Co Antrim yesterday was murdered by republicans. 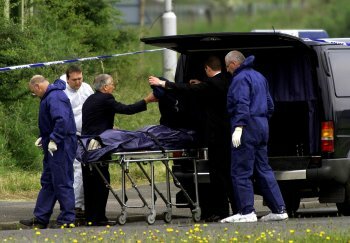 The former First Minister suggested the fatal shooting of Mr Ciaran Cummings as he waited at a roundabout on the outskirts of Antrim town could be linked to drugs. Loyalist murder victim Ciaran Cummings will never be "a mere statistic" of Northern Ireland's Troubles, as long as family and friends remember him, mourners at his funeral in Antrim were told today. The RUC officer in charge of the investigation of the murder of Ciaran Cummings, Detective Superintendent John Brannigan, flatly contradicted suggestions by resigned First Minister David Trimble that Mr. Cummings was shot by nationalists involved in drug dealing, saying there was "no information to suggest that republicans were involved". An RUC spokesman confirmed that while Mr Cummings had a number of minor criminal convictions none of them was in any way drugs-related. Meanwhile, Ulster Unionist sources appeared bewildered by Mr Trimble's comments, with a party spokesman saying the UUP leader had not been briefed by party headquarters on the matter. Ulster Unionist leader David Trimble apologised to the family of an County Antrim teenager shot dead on Wednesday. The former Northern Ireland first minister had claimed the murder of 19-year-old Ciaran Cummings was a result of a link with drugs and had been carried out by republicans. Police hunting the killers of a Catholic teenager who was shot dead on 4 July are examining a black motorbike found at a garage in a loyalist area of Antrim. The Ulster Unionist leader has apologised to the family of a County Antrim teenager shot dead on Wednesday after he linked his death with drugs. The name Ciaran Cummings will soon be forgotten by all but the friends and family of the 19-year-old shot dead in Antrim, the Bishop of Down and Connor, Dr Patrick Walsh, told mourners at his funeral on Saturday. Ciaran's mother reports receiving condolences from all over the Republic of Ireland and from her Protestant neighbors as well. The RUC are investigating a possible link between a stolen motorbike, a cache of amuunition, pistols, rifles, a smoke grenade and a flare uncovered at Tardrey forest in Antrim last night and the murder of Catholic teenager, Ciaran Cummings. RUC officers today arrested two men in connection with the murder of Gavin Brett, the Protestant teenager shot dead outside a Catholic sports club in Glengormley, on the outskirts of Belfast. Mr Brett (18) died in the arms of his paramedic father after he was hit by gunfire in a drive-by shooting claimed by the Red Hand Defenders (RHD). The murdered teenager was with friends outside St Enda's GAA Club when he was hit by gunfire intended for Catholics in the group. Loyalist thugs continue to make threats and carry out bombings and beatings against Catholic residents of Antrim. Part of this attack included the painting of death threats on roads, pathways and lamps outside of St. Malachy's Catholic School, which Ciaran's family went out and painted over. Despite wide publicity in local newspapers, authorities seem to be helpless to stop the intimidation. Diane V. Byrnes, the producer and host of "Echoes of Erin", a weekly radio program on WEDO-AM, Sundays at 1 to 2 p.m., inteviews Ciaran's mother, Kathleen Cummings, about what it is like to lose her son to sectarian violence. 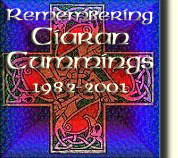 Ciaran is only one of many victims of sectarian violence in Northern Ireland. Protestant Trevor Lowrey was beaten to death by thugs who thought he was Catholic. Eighteen year old Gavin Brett was gunned down while standing with friends in front of the GAA Club in Glengormly. Postal worker Daniel McColgan, 20, was killed on his way to work in a North Belfast Post Office. These young people and more have died at the hands of the terrorists, who continue to intimidate their families by vandalizing graves and memorials and threatening them. 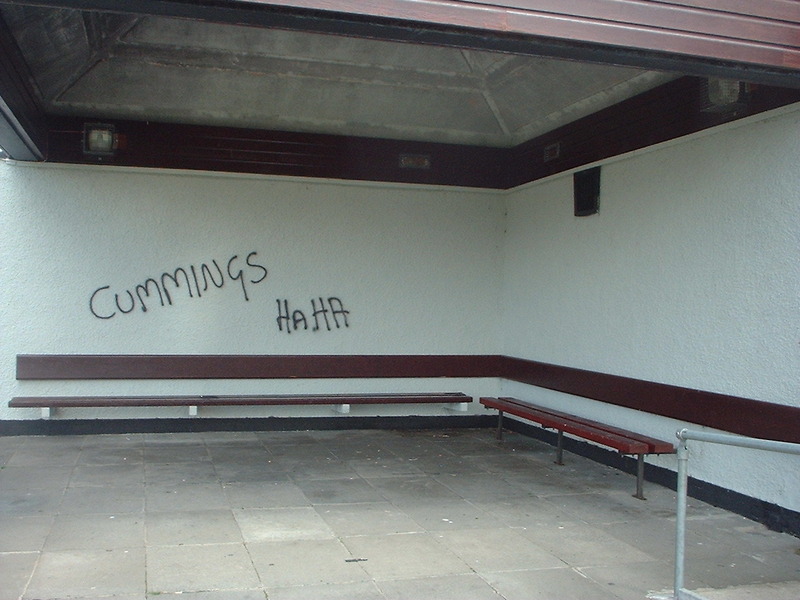 Photo taken at a tourist spot in Antrim town close to Lough Neagh Antrim Arena. Journalist Máirtin Ó Muilleoir has written a wonderful piece, telling people about this web site and why it was created. He deserves a lot of gratitude for helping with the effort to keep Ciaran's memory alive. Updated Book cites those killed during "peacetime"
Ciaran's name is still used in loyalist gang graffitti to terrorize Antrim Catholics and Republicans, while the Police Service of Northern Ireland do nothing to stem the tide of hate and violence fomented by these thugs. A caller claiming to belong to the Red Hand Defenders claimed the group had left explosive devices at a St Patrick's Day commemoration in Dungannon. NOTE: Ciaran is mentioned several other times in news reports, but generally just in passing reference during a report on some other issue. For instance, his name comes up on several lists of terrorist victims for 2001, and he is mentioned as an additional victim in reports of other murders by loyalists in Northern Ireland. Since these reports provide no new information, I have not reproduced them here. However, it is interesting that since mid-July 2001, police do not appear to have announced any further discoveries in the case, nor has anyone been questioned, arrested or charged, as far as I am aware. This speaks very poorly of either their investigative expertise or their desire to find and punish those who murdered Ciaran. If you have any additional reports or sources of information which should be included here, please e-mail them to me and I will investigate. Thank you. Loyalist Groups Gear Up for "Orange Jihad"
29 June 1999Red Hand Defenders and Orange Volunteers, splinter groups composed of radical members of LVF and UVF, promise to "pull the teeth of the Celtic Tiger." Approved 3 March 1999, in force 4 March 1999. Tribute to the victims of the 1981 hunger strike in Long Kesh prison and those killed by plastic and rubber bullets in Ireland. Lyrics to song "Ciaran Cummings"